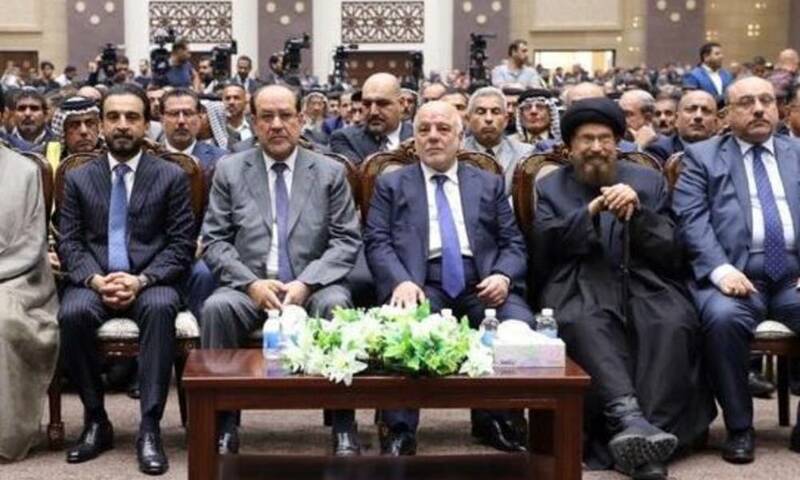 What is the secret of sitting “Abadi and Maliki” .. together in the forefront ..?! In a celebration of the anniversary of the birth of Imam Hussein, peace be upon him, Nuri al-Maliki and his political bureau chief, Haidar al-Abadi, appeared during the ceremony, sitting together in the lead. Many political analysts have suggested that the appearance of the two poles of Abadi and Maliki, sitting close together, is evidence of compromise and convergence of views. While others saw that this meeting, other dimensions, and it is only a continuation of the competition for leadership, especially after differences caused the weakening of the “party” in the marathon of negotiations because of the merging of the lists, and enter two separate lists in the elections where they went two different ways since the point of separation, The decision to register two lists, namely, “the rule of law and victory” .. In addition to the existence of a dispute on several files .. In this sense came the poles of advocacy, Abadi and Maliki in the lead in trying to each of them to prove leadership and issue.